‘How thousands of farmers lost everything’ states the title of a recent Dutch newspaper article about the consequences of a large-scale bioenergy project in Sierra Leone. The narrative may sound strong and clear, but it is also partial and suggestive. On 24th March 2018, De Volkskrant, a leading Dutch newspaper, published an article about the bioenergy investments of Addax Bioenergy and its successor Sunbird Bioenergy in Sierra Leone. Addax, which was financed by a wide range of institutions, including the African Development Bank and the Dutch Development Bank (FMO), was established (the land lease was signed in 2010) to produce fuel ethanol and electricity in Sierra Leone. Yet, as Addax continued operating at loss, its operations were scaled down and eventually taken over by Sunbird Bioenergy in 2016. The newspaper article, which was not the first on this issue to appear, positioned the investment, in particular the now closed operation of Addax, as ‘a classic case of land grabbing’ (in Dutch the word landroof was used, which literally means land theft, but seems to function as the equivalent of the internationally common term land grabbing). It highlighted negative effects such as loss of land and income, lack of clean drinking water and failure of the company to fulfil promises. Although the effects of investments like these are important, and it is laudable that this newspaper pays attention to it, coverage of these issues requires more nuance and critical reflection than currently offered. This implies not only providing a more balanced and correct view on the situation, but also a deeper understanding of the local dynamics at play. Before turning to these local dynamics, let’s first address some crucial factual issues: the article’s use of suggestive terminology, the presentation of incorrect information and the absence of a critical aspect. First of all, it is claimed that fertile lands have been taken away from farmers. In fact, the operation is branded as a case of landroof (land grabbing or land theft). By using this vocabulary, the legitimacy of the land lease is disputed. However, this should not be conflated with its legality, as the use of the term landroof risks. According to the law in Sierra Leone, the government can mediate, even organise, land leases for foreign companies. In this case, the government makes agreements with local landowners. Such an approach risks that companies do not have direct and individual agreements with landowners, whose voice may, subsequently, be limited. Whether this procedure is socially desirable is therefore open to debate (personally I don’t think so), but the land lease is still legal. Additionally, NGO’s such as ActionAid, FIAN and SiLNoRF, claim that this land is fertile, a claim which is uncritically taken over in the newspaper article. However, this claim is incorrect. The land in this area is not fertile, it is acidic, lacks important nutrients needed for proper agriculture and contains little organic material. From an agricultural perspective, this land is of low value and high costs need to be made to improve its productive capacity. Therefore, farmers are hardly able to survive of their land. Not surprisingly, most farmers in Sierra Leone are farmers by fate, rather than by choice, stuck in agriculture due to a lack of alternatives. Finally, these reports habitually overlook alternatives to farming offered by investments: the jobs generated and people trained. This is crucial, given that unemployment is a highly critical and contentious issue in Sierra Leone. In other words, it is important to look critically at large-scale investments in developing countries such as Sierra Leone, but journalistic coverage should offer complete narratives. Without this, reports such as offered by De Volkskrant remain suggestive, partial and incorrect, and may even become a hindrance for the country’s development. In addition to the above, it is crucial to take the local dynamics of expectations into account. NGO’s and other civil society groups (Sierra Leonean and international ones who distribute funding) play themselves an active role in these dynamics. This happens, for example, by the dissemination of information regarding companies’ responsibilities in so-called community sensitisation meetings or trainings. Let me give a recent example. 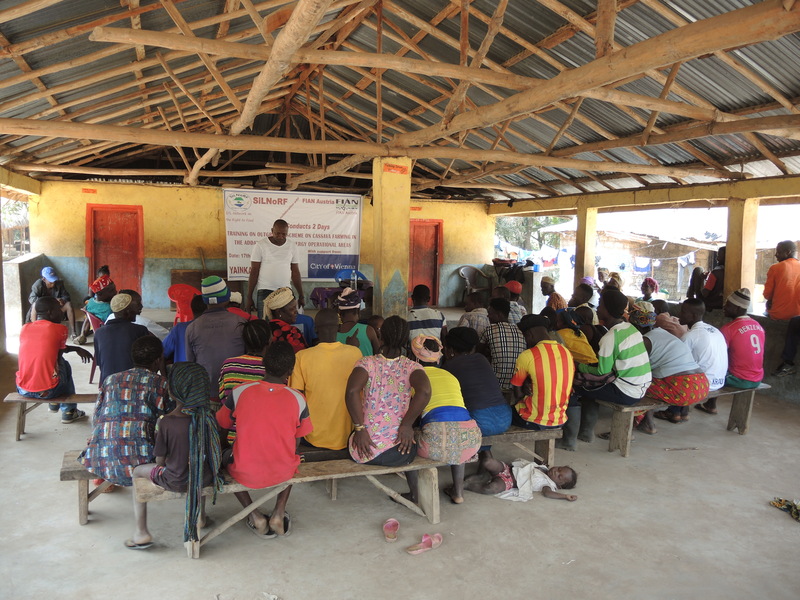 During a community training in this area conducted by a local civil society group and financed by international donors, communities were prepared for an upcoming social programme of the current company Sunbird Bioenergy (the company that took over Addax’ properties and is thus different from the initial investment). Different scenarios of the company’s plans for the future were sketched, such as the possibility that the company would offer inputs (such as fertilizers) and off-take guarantees for cassava production to farmers, when they decide to engage in this programme. Whereas these scenarios were intended as examples of potential situations, and serve communities to make better decisions, a side effect of such NGO intervention is that these scenarios become perceived and used as expected or even promised futures. As a result, expectations may be raised by a third party and, if not fulfilled by the company later on, a frustration created. Do these dynamics of expectations and the nuances discussed earlier render farmers’ statements about the negative consequences of this investment obsolete? No, they don’t. Yet, it is key to understand that these statements are made in a context of dependency relations. In Sierra Leone people are positioned in a system of patronage, in which relationships between powerful and dependent others are established (this happens elsewhere as well; the recent disputed appointment of Juncker’s aide Martin Selmayr as the new European Commission Director General may be a point in case). Not surprisingly, it is important to people to maintain these relationships because their survival often depends on the formation of alliances with those in higher power positions with better access to resources (this resonates with David Mosse’s research on development practices in western India). Consequently, just as companies or politicians are positioned in this system, NGO’s and journalists are as well; they may offer opportunities for development projects, skills training or simply influence. Subsequently, if a critical NGO or a journalist, whose position is clear to local communities, asks particular questions about the situation, the answers will be framed within this context and within this particular dependency relation. As a result, anticipated views and narratives may become too easily confirmed. Is this strange? No. Is it important to take into account? Yes. In sum, it is important to remain sensitive to the ways in which stories are created. This applies to the basic facts, which need to be balanced, to the dynamics of expectations and to the web of social relations in which different actors operate and that influence statements and opinions. This also applies to the usage of certain images. In the newspaper article under scrutiny here, for example, a picture of three people outside a fence is used. This picture, which deliberately contrasts starkly with some of those used in this blog, presents us an image of exclusion and marginalisation. However, what remains untold is that these people (who are they anyway?) are standing within the lease area, which shows that some parts of the lease are securitized and fenced off, but others are clearly accessible. What is also not mentioned is the large degree of theft that has taken place in the case of Addax. Consequently, is the presence of a fence to protect machinery and other items that are worth millions of euros so inexplicable? Does this not happen everywhere? In other words, we always need to be aware of what pictures do. What do they show, but also, what do they obscure? After all, when used in the way the newspaper article does, the picture becomes highly suggestive, contributing to a story which is partial and superficial. Concluding, with creating a story about ‘how thousands of farmers lost everything’ due to a large-scale investment, more nuance and critical reflection is required. In the first place, because readers deserve complete stories in order to understand the consequences of large-scale investments. In the second place because partial and suggestive stories may turn out unreasonably harmful. Rather than stimulating more responsible investment, the result may be the drying up of finances and investors giving up. With this, the hopes of thousands of farmers for a better future may vanish, and marginal small-scale agriculture remains the status quo, rather than a choice. Only an approach that makes a real effort to get the facts in balance, that highlights both negative and positive effects and offers a deeper understanding of local dynamics will eventually benefit both the general public and thousands of hopeful farmers in Sierra Leone. This blog is based on Robert Pijpers’ PhD research on the effects of large-scale investments in Sierra Leone funded by the ERC Advanced Grant, ‘Overheating’, ERC grant number 295843. Pointing out that the term landroof is inaccurate and risky is important. After all, suggesting that something illegal happened here changes the story significantly, not least because it shifts responsibilities. If an article wants to use this term it should explain what it really means and what it doesn´t. One can question, as I pointed out, whether the lease process has been the best practice possible. However, if one wants to question the legitimacy of this lease or the laws of a country, it needs to do so on the right terms and with a reference to the role of all stakeholders (including the government). Your comparison with slavery is misplaced. The use of suggestive pictures is a big deal: these pictures influence the imaginations of readers about this investment. In other words, when pictures are used that only tell one side of the issue, a story based on sentiment rather than on objective reporting may be created. I have also pointed out what exactly is the issue, while being very transparent about my own deliberate choice of pictures. After all, the blog is meant to further interpret and understand this article in a more nuanced way, it thus offers something in addition. Jobs: In 2012 Addax employed 2200 Sierra Leoneans, according to their own figures. In 2015, they employed a total of 3850 national employees, of which 1607 were permanent contracts and 2243 fixed term, according to figures of Silnorf and Bread for All (https://brotfueralle.ch/content/uploads/2016/03/MonRep-Addax-2016.pdf). Especially in the beginning many of these jobs (the majority) were lower level. As you may know, the educational level in Sierra Leone is not very high. However, over the years people were trained and promoted. During my last visit in 2018 to the current operation of Sunbird, the technical procurement department for example turned out to be completely Sierra Leonean, except for the head of procurement. Moreover, and I am unfortunately repeating myself, an article that talks about negative impacts remains partial if nothing is mentioned about employment. NGO´s and expectations: Please note that I do NOT accuse NGO´s of anything. This is a wrong interpretation. I am simply pointing out an aspect that the article overlooks while still talking about broken promises, namely that a broken promise of the company is not always what it looks like and may contain a longer social history. That is important because it helps people who are less familiar with the topic to understand how dynamics of expectations and promise may develop, dynamics which involve multiple actors. Related to the above, I think that the point I make about expectations exactly shows that I do NOT think you can have open brainstorm sessions without raising expectations (nor do I suggest that a company think so). The fact that there are numerous actors involved in this process - something which is important to point out in a debate on broken promises - is exactly the point. In addition, I indeed point towards dependency relations. I don´t understand why you suggest that I do not recognize these. The fact that I relate them here to NGO´s and the journalist - and not to myself or local politicians - has something to do with the article and the narrative I respond to. It allows me to point out that negative complaints are not obsolete or false, but that they are part of dependency relations. Recognizing this is important if you want to tell a story about large-scale investments. Lastly, I hope that you now better understand what this blog has done. Please also note that my research focuses on the effects, which are different from impacts, of large-scale investments. That is also written above. Although I am glad that you show interest in my work in general, I am certain that you also understand that this blog was meant to point out some critical issues with a newspaper article and a certain narrative about large-scale biofuel production in Sierra Leone. I always like it when people respond to an article in the newspaper and try to give a more nuanced picture of what really happens on the ground in Africa. It is good to put pressure on journalist to be accurate and nuanced. Yet, this time around I am disappointed. The claim that the word “landroof ” is not accurate because what happens is legal, sounds as a very weak argument to me. Slavery was legal for centuries as well; yet that makes it rather more (than less) appalling. Then the use of suggestive pictures; everybody uses pictures that support the story. You do the same here. No big deal. Then the claim that investors create jobs: a key point in the article is that the company went bankrupt….. Please inform us about the number of jobs created and the quality of these jobs. That would give a nuanced picture. Then you accuse NGOs of translating “examples in a decision making discussion” into “promises”. I have been working in African villages for decades and this is what happens ALL the time. If you, or the company, think that you can have a ‘open brainstorm session’ with poor people WITHOUT raising expectations you are dangerously naive. You dwell on the concepts of ‘patronage’ and ‘dependency’ yet it seems you do not recognize these when they unfold before your eyes. Rather disturbing for a sociologist/ anthropologist. Robert, I appreciate your attempt to offer a more nuanced picture, yet for me you failed so far. Please provide us with more concrete data about what ‘really’ happened and why farmers would need to be ‘happy’ about that. As I read that your PhD is about IMPACT of large scale investments, please inform us about that impact. I am open to learn about all kind of impacts; positive, negatives and anything in between. Thank you for your positive feedback and I fully agree with you. It would be interesting to learn about your experiences with the project, feel free to contact me via r.j.pijpers@sai.uio.no. Thank you for such a great article. I know this project well from its inception. It saddens me to see it being torn apart in such an unfair and biased manner with complete disregard of the efforts by the company and the context in which it was inserted. Yet the information is there. It is the first time I have read a more coherent piece of work on Addax. So thank you!